After losing Stevan Ridley for the season, the Patriots turned to a varied run game, mixing and matching Shane Vereen, Jonas Gray, and LeGarrette Blount. 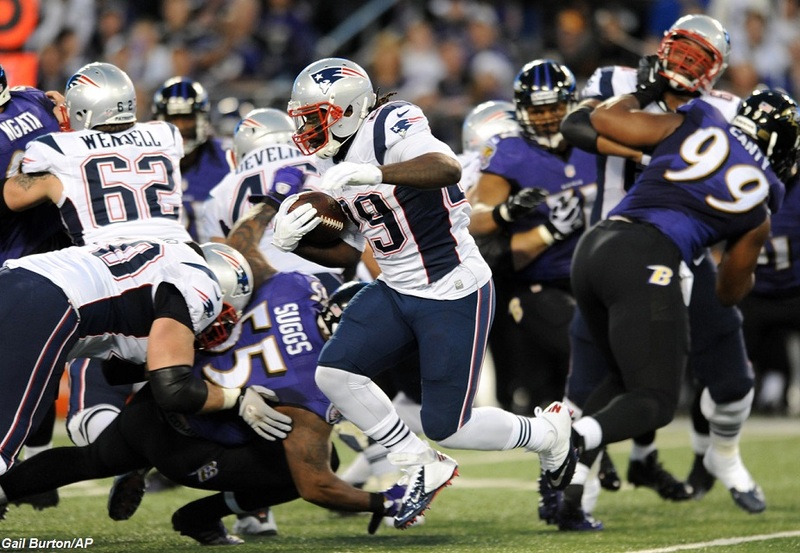 Brian Filipiak explains in Part 2 of his Patriots vs Ravens Rushing Preview how the Patriot backs’ differing styles allow them to tailor their rushing plan to opposing defenses, with varied success. Part 1 examined the Ravens’ approach to running the ball. While the Ravens have an established lead back, although perhaps not the one they expected to have at the outset, the Patriots have used a cadre of running backs after losing Stevan Ridley to a season-ending ACL injury in Week 6. Depending on the matchup and preferred mode of attack, New England has used the running back best-suited for the game plan. When using up-tempo, no-huddle or spread formations, the Patriots favor Shane Vereen for his versatility in the passing game and ability to run the draw. When utilizing more traditional power formations with a fullback and/or an extra tight end or offensive lineman, the team leans more heavily on one-cut downhill runners like Jonas Gray or LeGarrette Blount. Overall, the Patriots finished the regular season tied for 22nd in the league with a 3.9 yards per carry average. The middling numbers stemmed in large part from inconsistencies along the offensive line, both in terms of changing personnel and their erratic execution. Since each running back brings a different set of attributes, offensive coordinator Josh McDaniels and offensive line coach Dave DeGuglielmo install run schemes that fit their diverse styles. Where the Ravens running game has an established identity (stretch-zone), New England’s tendencies vary from game to game and from running back to running back. As such, the offensive line is often tasked with operating both man- and zone-blocking techniques, although leaning more toward the former. Given the number of different line combinations used this season by the Patriots ‒ whether the result of injury or poor play ‒ it’s been a challenge for the unit to find cohesion both scheme- and personnel-wise. When the Patriots attempt to run the ball against Baltimore, here are a few concepts likely to be seen. Notice the handoff action, as quarterback Tom Brady opens up to the opposite side of the handoff/run direction while Blount uses a crossover step. This combination usually generates a false step by the defense and provides the blockers with more favorable angles, particularly on difficult reach blocks like the ones executed by right tackle Marcus Cannon and center Ryan Wendell. It is Wendell’s block on defensive tackle Arthur Jones (#97) that prevents initial penetration into the backfield and allows Connolly to pull. The designed hole for the ball carrier on the play-side develops through three actions: the double-team block on defensive end Haloti Ngata (#92), the seal block on outside linebacker Terrell Suggs (#55) and the trap block by Connolly on the inside linebacker. Blount follows the lead of his guard and picks up a productive five-yard gain on first down. The Patriots also run similar concepts with a lead fullback ‒ sometimes even combined with a pulling guard ‒ flooding the point of attack with more blockers than a defense can typically handle. Like the Ravens, Josh McDaniels and the Patriots offense use this play to set up play-action which uses the same blocking action. The initial steps by Vereen on the counter play act as a timing mechanism that allows the blocks to be in place before the ball carrier arrives. As seen above, Gronkowski comes in motion just prior to the snap and positions himself between the guard and tackle. Center Bryan Stork and right guard Cameron Fleming diverge for Gronkowski to hit the second level linebacker. Even though the blocking execution on this play is far from ideal, Vereen does a solid job setting up defenders with a couple of nifty side-step moves on his way to a seven-yard gain. After Ridley’s season-ending knee injury and before Blount rejoined New England in late November, the stretch play became somewhat buried in McDaniels’ playbook. Recently, though, it has re-emerged as a go-to play for Blount. Using two tight ends in an unbalanced formation to the defense’s right, the Patriots execute the stretch run to the strong side, providing a good example of how the blocking scheme creates numerous cut-back lanes. The success of the run hinges on the two double-team/combo blocks on Ngata and Suggs, respectively. With both defenders walled off, Blount cuts back to find an opening to the inside of left guard Josh Kline. As the running back hits the hole, Wendell and Logan Mankins (working off the double team) stymie the inside linebackers ‒ who are both out of position off the snap. The ball carrier picks up 11 yards on the run and a first down. Although the last matchup between these two teams saw Brady drop back to pass just 28 times, the Patriots may elect a more pass-heavy approach this time around. The Ravens held running attacks to 3.6 yards per carry during the regular season and are the fifth-best defense against the run, according to Football Outsiders defensive efficiency ratings. While the Baltimore front includes well-known All-Pros in Ngata and Suggs, centering the middle of the defense is impressive nose tackle Brandon Williams as well as inside linebacker C.J. Mosley ‒ a favorite to win defensive rookie of the year. Given the talent of Baltimore’s front seven and their capability in stuffing the run, New England may try to test an injury-riddled secondary early and often by using spread formations and a quick-passing attack to defuse the Ravens’ pass rush. If so, look for Vereen to take the bulk of the snaps in the backfield.